Sadler's Wells Theatre is a performing arts venue located in Rosebery Avenue, Clerkenwell in the London Borough of Islington. The present day theatre is the sixth on the site since 1683. It consists of two performance spaces: a 1,500 seat main auditorium and the Lilian Baylis Studio, with extensive rehearsal rooms and technical facilities also housed within the site. 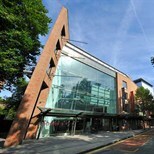 Sadler's Wells is one of the United Kingdom's foremost dance venues and producing houses, with a number of associated artists and companies who produce original works for the theatre. Sadler's Wells is also responsible for the management of the Peacock Theatre in the West End. Angel (Northern Line City Branch) is a 250-metre walk from Sadler's Wells. The nearest train station is Highbury and Islington or Kings Cross. There are no turns into St. John St from Pentonville, City and Goswell Roads. The easiest route is from Pentonville Road into the west side of Claremont Square and down Amwell Street. Numbers 19, 38 and 341 travel from the West End to the theatre's own bus stop. Many buses travel from Waterloo, Liverpool Street, Euston and Kings Cross stations to the Angel. On-street free parking in Hardwick Street and other streets off Rosebery Avenue after 6.30pm Mon-Fri and from 1.30pm on Saturdays (heavy fines apply to parking in residents bays). There is a large 24 hour car park in nearby Bowling Green Lane. The theatre is fully accessible for wheelchair users. The theatre has Induction loops and minicoms. Guide and Assistance Dogs are allowed in the auditorium. Please let the theatre know by calling the ticket office on 0844 412 4300. If you require further information and/or disability related assistance please contact the venue on 0844 412 4300 or email access@sadlerswells.com.